Treadmill walking is a great way to burn extra calories each day to help you lose weight. Aim to burn 300 extra calories per day with cardio exercise such as brisk walking. This is about 60 minutes per day of moderately-intense exercise, in addition to controlling the number of calories you are eating. Challenge your body by changing the workout throughout the week with harder days alternating with easier days. You can modify this schedule to fit our own lifestyle. You can add in rest days as needed, but it is best not to have more than one rest day in a row. If you can't schedule enough time on the treadmill, add one or more non-treadmill 15-minute walks throughout the day. Monday: Fat-Burning Walking Workout. Start the week right with 60 minutes of a fat-burning workout. You will burn between 300 and 400 calories depending on your speed and weight. You can break this workout into two sessions of 30 minutes if you can't set aside a continuous hour. After warming up for 10 minutes at an easy to moderate pace, increase your pace to a brisk walk that brings your heart rate up to 60 percent to 70 percent of your maximum heart rate. Many treadmills have a grip pulse detector or heart rate monitor that can help you track your heart rate and exertion. Tuesday: Health Walk. You put in a great effort on Monday, so today you will take a 30-minute walk at an easier pace for your cardio exercise, at a heart rate of 50 percent to 60 percent of maximum. This is the minimum recommended per day to reduce health risks such as diabetes and heart disease. Use this workout to concentrate on your walking posture and technique. This will help you speed up in your more vigorous workouts. Follow up your treadmill session by doing an upper body workout with dumbbells or exercise bands. Wednesday: Treadmill Hill Workout. You can burn more calories per minute when using the incline feature of your treadmill. If your treadmill has pre-programmed hill workouts, choose one to use today. You can choose a steady climb or hill intervals. Because you will be working harder, aim for 45 minutes and get in at least 30 minutes of hill work, with your heart rate in the fat-burning zone of 60 percent to 70 percent of your maximum heart rate. Thursday: Health Walk. Walk for 30 minutes at a moderate pace. Follow it up with abdominal-core workout exercises. Saturday: Distance Workout. Aim for an hour or more of walking on the treadmill at a comfortable pace. You may want to catch up on video while you walk. Or, take your walking outdoors for the day and walk in a park, along a greenway, shopping, or exploring. Wear a pedometer or track your mileage so you can balance how many activity calories you are burning with any weekend diet splurges that may be planned. Sunday: Active Fun and Stretching. Put your walking legs to work just enjoying an active day with friends and family. Use a warm-up stretching routine to loosen up. Experiment with other activities such as bicycling or swimming, which will exercise different muscle groups from walking. The goal today is finding joy in moving and being alive. Repeat the treadmill workout week pattern. Explore the different pre-programmed workouts on your treadmill for variety on the hill workout day and the speed interval day. 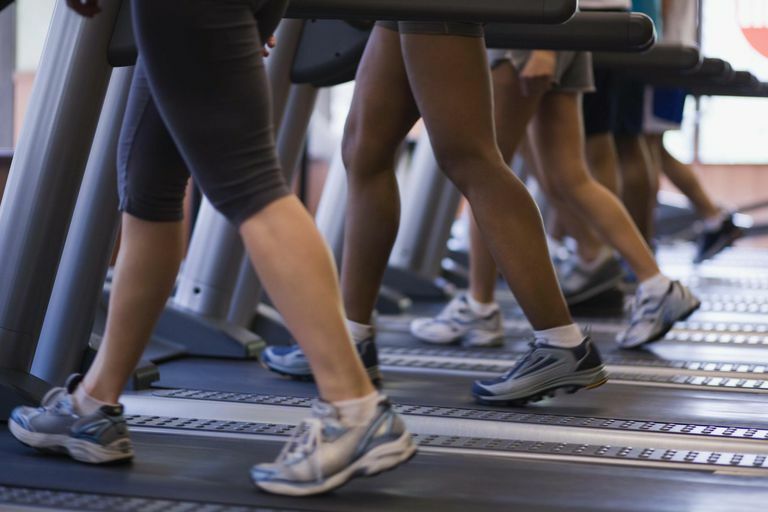 If you haven't been walking regularly for fitness, you may need to start off with shorter treadmill sessions and build up your time each day. Achieve 60 minutes per day of activity by adding 15-minute walks throughout the day as needed. To lose weight with exercise, you also need to control the amount that you eat. Start a sensible diet and use a food diary to be honest with yourself about your calories eaten. If you burn 300 more calories per day than you eat, you can expect a weight loss rate of one pound per week. Modify the weekly schedule to fit into your lifestyle. Work on your walking posture and form, especially using tips on how to walk faster so you can burn more calories within the same workout session. As you progress, you may improve your fitness and lose weight so that you'll need to use more speed and incline to raise your heart rate into the desired exertion zone. Wishing you weight loss success on the treadmill.